It was after midnight when they rang my doorbell. I opened the door a crack and they showed me their badges. Federal, of course, but I knew that already; they always travel in pairs. “You taking me somewhere?” I asked. “Yeah. Dee See,” said the tall one. “The National Archives...” the male one began, I guess because he was feeling left out. He shut up after a glare from his partner. “Aren’t they all?” the senior agent asked rhetorically, pointing me to the limo. Six hours later, I was hustled into one of those anonymous meeting rooms that seem so plentiful in Washington. Five other people were already standing around the sturdy oaken table. I recognized the Librarian of Congress: a snappy dresser and surprisingly skilled dancer. I looked down at the page. Okay. I could tell this was going to be a tricky one. What’s With All the Capital Letters? It’s important to remember that English didn’t have formal capitalization rules until the early 18th century. 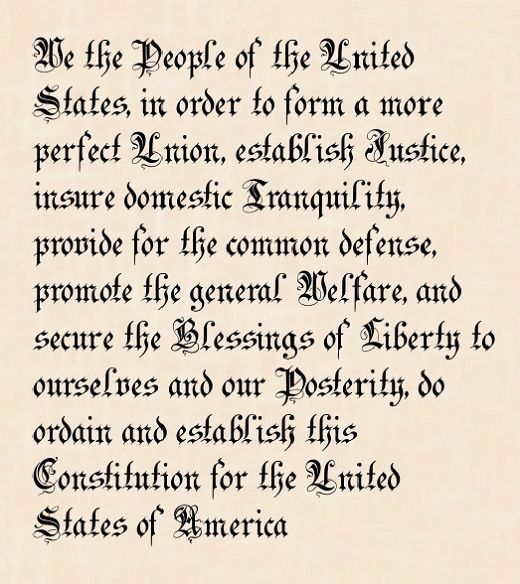 Even by 1787, when the U.S. Constitution was drafted, it was still a common style to capitalize most nouns, a practice held over from German’s influence on early English. In the decades since, the convention has shifted, and fewer words are capitalized today. That has created a problem for some business managers and owners who, even today, find it hard to adjust from their professional writing traditions in order to write for a general audience. For instance, attorneys may be used to capitalizing words such as Federal, State, Court, Government, Appeal, and many others, if that is the custom in their jurisdictions; but when they use the same style to write professional web content, it just looks silly. At other times, I’ve encountered well-educated business owners who simply never learned the rules for capitalization. Their writing can be meaningful—sometimes inspired—but it’s also prey to what I call Random Capitalization Disease. When the upper case is used willy-nilly throughout the text, at best the reader becomes distracted. More often, ignoring capitalization rules (or any other basic grammar precept) means a loss of credibility for your website content. The first word of each sentence. Proper nouns, except in the rare cases of named written in lower case (such as bell hooks and e.e. cummings). Proper adjectives, which are adjectives formed from proper nouns; for instance, Italian food, Russian roulette, and Renaissance man. The names of religions, deities, and religious terms. Examples: God, Jainism, the Prophet, Christianity, the Torah, and Zeus. Note that we capitalize His and Him when they refer to God. Days of the week, months of the year, and specific holidays. Note that seasons of the year are not capitalized. Important people identified with both titles and names. For example, we capitalize Queen Elizabeth II and President Obama, but we use lower case when talking about the queen or the president. Similarly, we capitalize Aunt Beatrice, but not my aunt (where no name is specified). A few religious notables have their titles capitalized even when not identified by name, such as the Dalai Lama or the Archbishop of Canterbury. Distinct geographical regions. Examples: the Middle East, the Deep South, the Florida Panhandle, the West Coast. Note that compass directions are not capitalized when used by themselves, or even when used descriptively; so we don’t capitalize the eastern suburbs or northern Virginia. Western Australia is capitalized when referring to the state, but western Australia isn’t capitalized when referring to half the continent. Distinct historical periods or events. Examples: the Black Death, the Cold War, the Middle Ages, the Eighties, and the Great Depression. The names of languages, nationalities, and ethnic groups. Examples: Old High German, the Belgians, and the Sioux. Abstract philosophical concepts. Example: Dolores always said that Thursday night bowling was part of her search for the Truth. The word Internet. This is slowly losing its special status, but most professional style guides still recommend capitalizing the word. The interjection O. Example: Lighten our darkness, we beseech thee, O Lord. We must remember that headlines, titles, subheadings, and the like are also parts of standard prose, but they use an entirely different set of rules. The cramped typography of early broadsheet newspapers meant that something had to attract the reader’s eye to the start of new articles. A different set of capitalization conventions—now known as “headline style,” “title case,” or “capital case”—evolved to fill that role (along with changes in typefaces and weights). Always capitalize the first word and the last word, even if they fall under one of the exceptions listed below. Always capitalize verbs. Yes, that definitely includes forms of “to be”: Is, Was, Are, Were, Has Been, and all that lot. Don’t capitalize common small words—the articles, conjunctions, and most prepositions. You want a list? a, an, and, at, but, by, for, in, nor, of, on, or, the, and to. Notable small words that still get capitalized: If, Than, Then, any word of two or more syllables, and almost all the pronouns. Two small words could go either way: As, It. Most of the time I will leave those in lower case, but I will capitalize “it” when it’s the last word before punctuation or the final word in the title. Still, you can make the style decision for yourself. doesn’t it look Peculiar when capitalization rules ARE ignored? You want your website content to be distinctive, sure. You don’t want to be notorious for quirky capitalization, bizarre usage errors, or mangled grammar. At Foster Web Marketing, we’re pleased to produce regular tips on grammar and style to help nudge you in the right direction. Please, take the time to browse through our collection of content writing articles to brush up on those fine points of grammar you last encountered in grade school. Or you may prefer to contact us for more personalized advice about your business website content or promotional books and reports for your business, practice, or firm.